A quick view of the most influential metrics in Honolulu. Honolulu ( /ˌhɒnəˈluːluː/ or /ˌhoʊnoʊˈluːluː/; Hawaiian: [hono'lulu]) is the capital and the most populous city of the U.S. state of Hawaii.a[›] Honolulu is the southernmost major U.S. city. Although the name "Honolulu" refers to the urban area on the southeastern shore of the island of Oahu, the city and county are consolidated as Honolulu County which covers the entire island. For statistical purposes, the U.S. Census Bureau recognizes the urban part of Honolulu as a census-designated place (CDP). 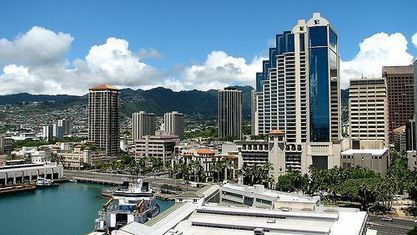 Honolulu is a major financial center of the islands of the Pacific Ocean. The population of the census-designated place was 337,256 at the 2010 census, while the population of the city and county was 953,207. Honolulu is the most populous state capital relative to state population. In the Hawaiian language, Honolulu means "sheltered bay" or "place of shelter". The old name is said to be Kou, a district roughly encompassing the area from Nuuanu Avenue to Alakea Street and from Hotel Street to Queen Street which is the heart of the present downtown district. The city has been the capital of the Hawaiian islands since 1845 and gained historical recognition following the Japanese attack on Pearl Harbor near the city on December 7, 1941. View our selection of available properties in the Honolulu area. Check out the latest demographic information available for Honolulu. Get to know Honolulu better with our featured images and videos. Learn more about schools near Honolulu complete with ratings and contact information. Browse through the top rated businesses in the most popular categories Honolulu has to offer.